1 Ladybugs are animals. Don't be surprised. You didn't think they were plants, did you? Some ladybugs are red with black spots. They have black heads. They have six black legs. They are insects called beetles. In fact, some people call them lady beetles. They are called ladybirds, too. 2 Some ladybugs don't have any spots. They are red with black heads and legs. Did you know that ladybugs can be other colors? Some may be orange. Some may be yellow. Some may be pink. Some may be white. Some may be brown or black. They may have spots, but they may not. 3 They live in fields and forests. They eat tiny bugs called aphids. Farmers like ladybugs. 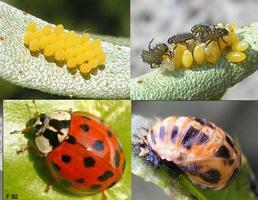 Ladybugs eat aphids that can kill the farmer's plants.